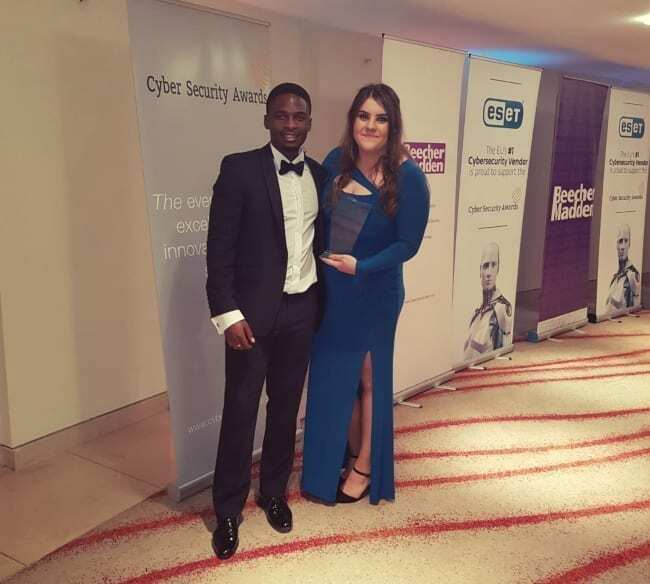 Our rising-star, Chelsea Cadd (DevOps and Security Analyst), has been crowned Newcomer of the Year at the Cyber Security Awards announced on Thursday 21 June. She beat off intense competition from four rivals to win the coveted award. The Cyber Security Awards were established in 2014, to reward the best individuals, teams and companies within the cybersecurity industry. Excellence and innovation are core themes, throughout all categories. Winners were announced at the awards ceremony, on Thursday 21 June 2018, at the Park Plaza Hotel, Victoria. Chelsea joined Invotra in July 2013 as a Networking and IT systems apprentice in the Client Services team, after completing A-Levels at Farnborough Sixth Form. Rather than University, Chelsea chose an apprenticeship course in Networking and IT Systems. She has been with Invotra ever since, benefitting from learning on the job, working with industry experts and being debt-free. Invotra quickly spotted Chelsea’s potential and encouraged her to pursue a technical path, promoting her to Test Manager with responsibility for building a team and recruiting new apprentices. Invotra is a UK Top 100 Apprenticeship Employer and promotes continuous learning. The company encouraged Chelsea to gain her ISTQB Certified tester qualification to further knowledge in the field. She has made rapid progress in her career to date. Chosen to represent the company at a conference in Stockholm, Chelsea first discovered her passion for Cybersecurity. She is now halfway through her next qualification, a Level 4 Apprenticeship in Cybersecurity which includes cryptography, IT law and ethical hacking modules. She is one of the few women enrolled in the country and proudly represents the female sector working in the cyber security field – only a small portion (11%) are women. Chelsea is currently assigned as one of Invotra’s information security officers in charge of our ISO accreditations. She is overseeing the company’s annual internal audits, surveillance audit and preparing for our recertification audit which will take place in 2019. ISO 27001:2013 certification means that Invotra is measured against 35 security categories with 114 controls in place. At this year’s surveillance audit Invotra achieved no major or minor non-conformities. The company is in the process of obtaining ISO 9001 certification, CSA Star certification and Cyber Security Essentials Plus. Chelsea’s success was celebrated in the Woking News and Mail. Read their coverage here. Invotra is a leading SaaS provider of enterprise intranet and portal solutions. As well as local councils we deliver software services to over 45% of UK central government departments including DWP, HMRC, the Home Office, Department for Transport and Sierra Club in the US.